If you've seen our blog posts about different forms of DNA (A, B, Z), nucleosomes, telomeres, or DNA sequencing, you might get the idea that we're a bit obsessed with DNA. And, you'd be right. We find DNA to be amazingly fascinating and beautiful, as well. That fascination and sense of wonder inspired us to devote our first classroom digital biology lab, based on Molecule World™, to a hands-on lab where students of all ages can explore the ways that other molecules interact with DNA. Anyone can work with theMolecule World DNA Binding Lab to investigate where other molecules are binding to DNA. Today's students don't have record players and many don't know what a "groove" is. Nevertheless, DNA does have areas that are wider (major groove) and areas that are narrower (minor groove) and the molecules that bind to these areas, bind in very specific ways to these different kinds of grooves. When I was an undergraduate, the difference between the major and minor grooves of DNA was always a mystery. I could never see the difference from the pictures in my textbooks, so I never understood what the professor was talking about when this idea came up in a lecture. But, when I saw a DNA structure in 3D, in Cn3D, a molecular modeling program from theNCBI, I finally understood what this meant. When I could see a DNA structure, turn it around, and manipulate it, that the concepts of major and minor grooves made sense. Whether humans understand the difference between the major or minor grooves, or not,doesn't matter to molecules.A drug, like Tamoxifen (a drug for treating breast cancer), that binds to the minor groove, fits best in the minor groove and not to a random spot in DNA. 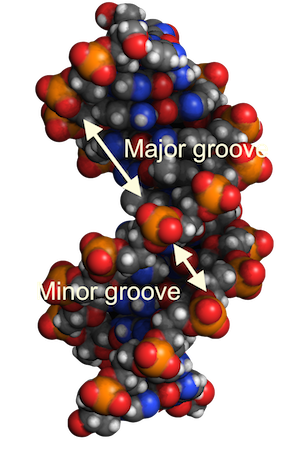 Proteins that bind to the major groove, are only going to recognize the major groove, and often specific DNA sequences. Some types of proteins will bind to both the major and minor grooves, sometimes these also bind to specific DNA sequences. Having students see these types of interactions and discover for themselves, how these molecules are binding to each other, is a powerful learning experience. We provided three examples in this lab for students to practice and see how molecules might bind to DNA. The first example is the DNA molecule on the left. We want students to look at this molecule, find the major and minor grooves, turn it around, color it in different ways, try different drawing styles,and use the color key to identify the different elements. The other two examples show molecules bound to either the major or minor grooves in DNA. Changing the drawing and coloring styles with these examples helps show where the other molecule binds to DNA. Using the residue coloring style can show if the other molecule is a protein or if it's a drug since drugs don't have amino acid or nucleotide residues. Like our Molecule World iPad app, students can capture images in the Molecule World DNA Binding Lab. This allows teachers to assign unknown structures to students and assess their abilities to evaluate what they're seeing and use evidence to support their reasoning. We're pretty excited about this because it means that a nice, hands-on, learning activity, can now be carried out in many kinds of classes and open the doors to understanding for a larger number of students. Take a look at the Molecule World DNA Binding Lab iPad App and please share your feedback! Our goal is to make real data and data analysis tools work for all students.